Have you ever observed when invigilators start distributing papers they move like a herd of Velociraptors ready to hunt? In case you haven’t, I did it for you all! And that’s not the only thing I did at my CIMA exam! I answered an imaginary question also! Anyway, rather than sitting on this post venting for a long time, let me get straight to the real purpose of this post, that is to spread some love, and get started with it! In past I’ve been gratified with 3 blog awards by 3 super cool bloggers. Kemi aka. the Task Mistress; my future possible probable business mentor presented me with the Valentine’s Blog Award, while Indu from India who is an aspiring movie director and Mia from Indonesia who loves reading and also a big fan of Shane the sheep presented me with the Versatile Blog Award. I think there’s more to these wonderful gestures than mere awards, because according the obligations that come with the award you must reveal more about yourself and introduce other bloggers to your readers/ fellow bloggers to obsess over! So fulfilling the first part of the obligation, let me compile a list of things you may not know about me. 01. As at today I’m 21 years, 6 months and 12 days old, but I have no idea what I want to be/ do when I’m finally done with my studies! If you ask me today, I’ll tell you I want to study further (or should I say from the scratch?) on Cinematography and do something related to that field. Yet, if I know me right, this is bound to change! So do I need to tell you that I too am excited to see how life will unfold for me? 02. I always wanted to own a tree house, and I still do. And now I want to own a house on the top of a hill with a sliding roof too, so that I can look at the stars at night! Good luck to my two friends who study architecture! Just know that I won’t leave you alone till you deliver what I want! 03. I have a fantasy to wear a white stud on my nose and red, pink, purple studs on my left ear and yellow, green, blue studs on my right. One of my friends warned me she’ll never allow any of her kids (who won’t pop up to the world at least for another five years!) anywhere near me if I turn my fantasy into a reality! But as you can see, I’m still hopeful! 04. I have my very own trends and patterns when it comes to consumption! They are more like seasons! If the queen of my season is slippers, then you’d find me frantically buying slippers almost every where I go! And with time when I have a slipper set closer to a mountain, I’d get past it and switch to buy something else, hardly ever looking at/ using my slipper collection again! In past I’ve had anklet, slipper, friendship band, nail polish, first day cover (stamp) seasons like that. And these days my eyes are all over on sleeveless tops! 05. As some of you may know I have a wardrobe book collection! Why have I included it here? Lets just say it’s because I want to let you all know that I included 10 more books as my latest addition! 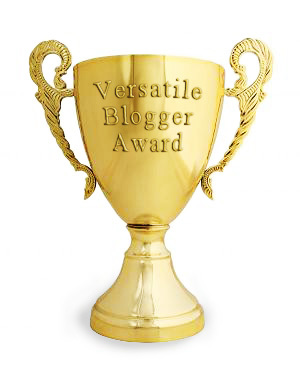 Now as the second part of the obligation, let me do the honour of bestowing the Versatile Blog award to the most amazing bloggers out there! PSYCHODOODLE – An awesomely witty dog lover and a pure bred Sri Lankan. Man hunter/ man slaughter! (Kidding!) But guys, you should stalk her starting from Mission Impossible 6! FLOW… – Georgina is from London. And she is always ready to hit the road! Read her blog to find out more about her escapades! You give me idea, I give you a story – Mawajowe is an enthusiastic music lover. But her blog posts are not only regarding music! Whatever I Have Said Or Sung – Antara is an upcoming poetess who has an eye for the nature. She is into photography, as well as sketching! REFLECTIONS – Just as the name suggests this blog is mostly about Trishdar’s reflections on life! Versakay’s Blog – Versakay is undoubtedly the mystery in the cyber space! He is an Indian who opts to reveal himself little by little as he writes the blog! So read his blog if you are interested in solving this mystery! webunrapped.com – Sauravluk9’s blog is like an Encyclopedia for women! I simply love to read what she writes about tattoos, books and movies! FOR YOUR AMUSEMENT – No one can be more serious about this blog title! Kim absolutely delivers you what she promises! I don’t know from where she finds these ways to amuse us! But I’m glad she does! Flickr Comments – Frizztext is a photographer more than a writer who captures life through his lenses! ගෝල්ඩ් fishගේ blog ටැංකිය – This Gold Fish is one cool blogger out there! And he never runs out of anecdotes! If you know Sinhala language (which is only used in Sri Lanka by the way! ), you should definitely check this blog! Till I write again, stay tuned and enjoy these blogs! Thank you!! and i guess it’s obvious why u got 3 awards!!! Hope your exams went well – when do you get the results? Oh my god…! Thanx mam. crap. I meant ‘crowds’. Typical case of stage fright. Very kind of you for having considrered me for the award. Thanks also for introduced me to many other versagtile bloggers , who I am sure will take a lot of my time in future, and incidentally enthal me. Hope the exams weren’t bad. My blog buddy from the UK took the same exam. First, I want to wish you luck with the exams. 🙂 I have some exams that I need to take care of, and frankly, I’m a little scared. Hopefully, I will explain everything until the end of July. Aw, maaaan… That is a lot of work. 🙂 However, I will find some spare time this week to do it. Why do you stop playing chess………….. ? yes.I am……..do u play online chess. (chess.com,playchess.com,chesshere.com) ..? I played online Chess till 2010. 😀 You seem like an enthusiastic Chess player. How to contact you? Are you on FB, Skype? Thanks so much for sharing with us. Hope you did well in exam. God bless.